With temperatures hovering in the 90s here in the Northeast, who wants to turn on the oven or slave over a hot burner? Not I, and probably not you. 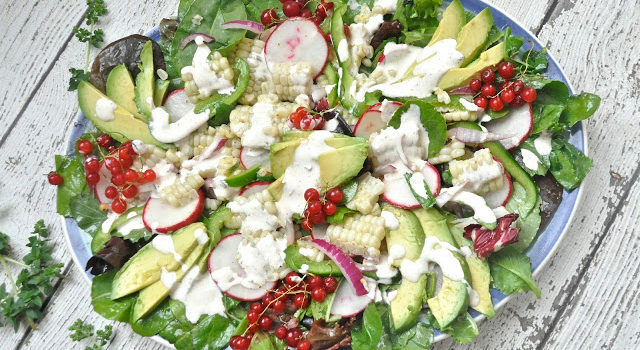 When I saw this beautiful salad in Coastal Living magazine, I knew this would be perfect for one of those steamy days as we’ve had this week. Picking a ripe melon is difficult, but I let both the cantaloupe and the honeydew sit on the counter for a few days to be sure they were at their peak. 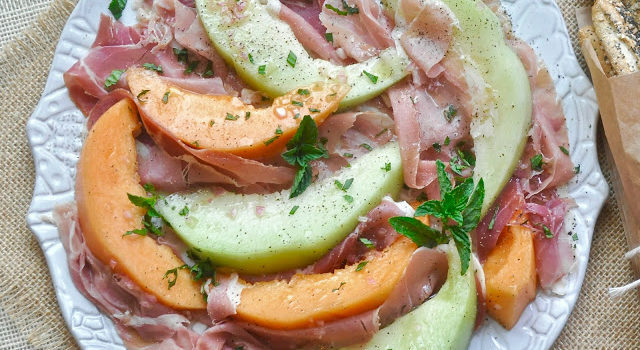 The combo of sweet melon in season, with fragrant salty prosciutto isn’t a new one, but the mint vinaigrette takes it to a new level. Got a partner with a he-man appetite who requires a heftier meal? Then just add a couple of hard-boiled eggs on the side, a hunk of good cheese, or both. Breadsticks are always a good idea too, especially when they’re covered in lots of seeds. 1. Whisk together vinegar, shallot, honey and salt in a small bowl. Add oil in a slow, steady stream, whisking until incorporated. Stir in 1 tablespoon chopped mint. Set aside. 2. Remove and discard seeds from 1 half of each melon; cut each into 2-inch-wide radial spokes, about 6 slices each. Reserve remaining melon halves for another use. 3. Using a sharp knife, follow the natural curve of the melon to remove the rind. 4. 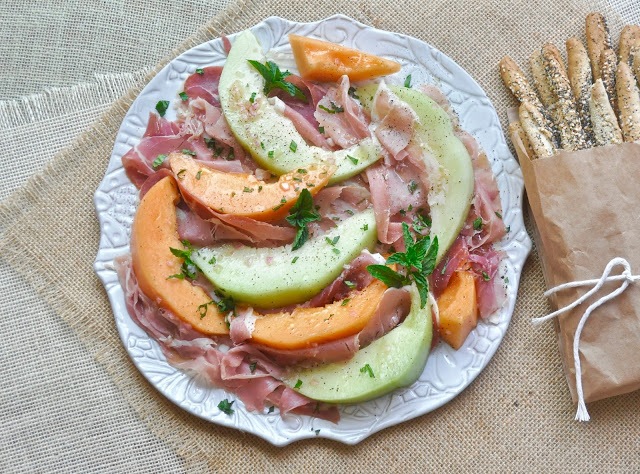 Arrange melon pieces and prosciutto slices on a platter. 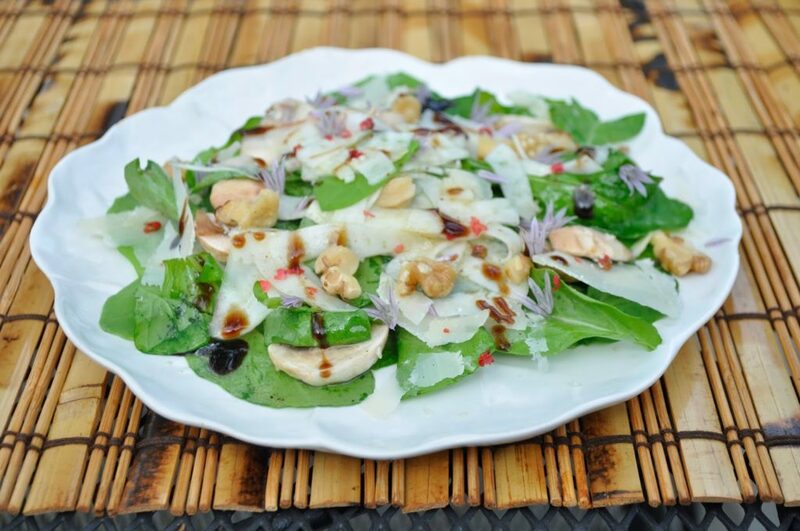 Drizzle vinaigrette over the top; sprinkle with black pepper and remaining 1 tablespoon mint. It’s here and it crept up on me – bathing suit season, that is. ugh. Is it too late to start dieting now? Oh forget it – there’s just too much good gelato in my future. But it can’t hurt to have a light salad or two for lunch or dinner. 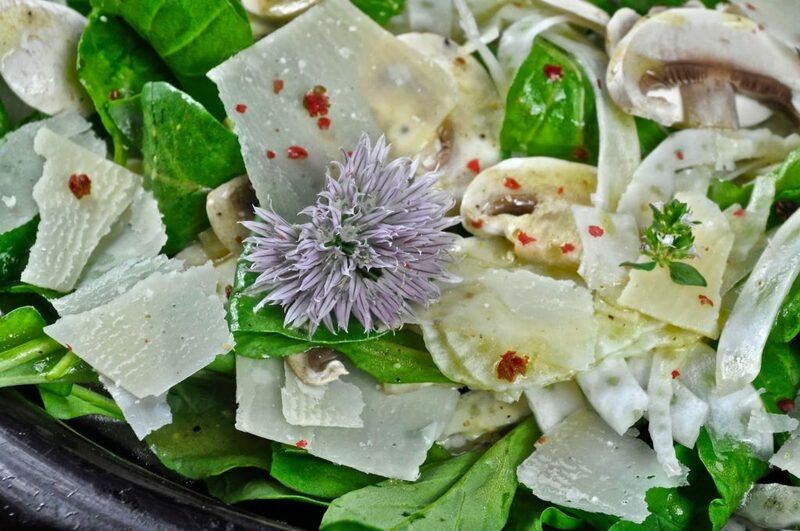 I’ve always loved raw fennel and raw mushrooms in a salad, but this one is kicked up a notch with the addition of chive flowers and pink peppercorns – not original ideas to be sure, because almost everything’s been done before. But I did get inspired to use those pink peppercorns after seeing Lori’s salad here, and to throw in those chives after seeing Stacey’s dish here. You’ll need a mandolin to cut the fennel thin enough, but we careful of those thumbs and fingers. Shave the parmesan with a cheese plane, crush the pink peppercorns, and toss in some chive flowers or tiny thyme blossoms. And don’t worry about those few extra pounds — enjoy the gelato. Mix all the dressing ingredients in a jar. 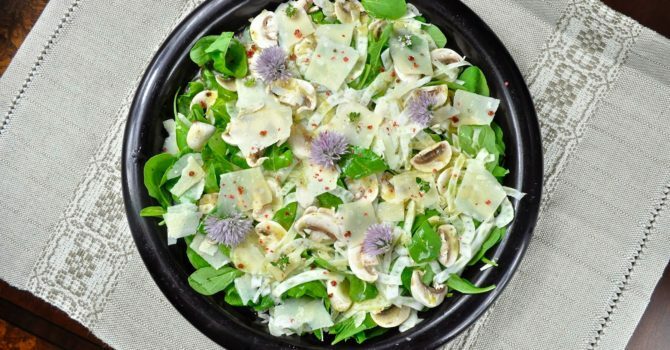 Wash the arugula and toss with enough of the dressing to coat. Slice the fennel thinly using a mandoline. Careful not to cut yourself. Toss the fennel with a bit of dressing and place over the arugula. Wash the mushrooms and slice thinly. Scatter them over the salad, then shave parmesan cheese over everything. Decorate with chive blossoms and/or thyme flowers. Drizzle a little aged balsamic vinegar over the salad, if you have it. Otherwise, it’s fine just as is. It’s that short period of time when blood oranges are in season and I can’t get enough of this beautiful citrus fruit. Of course, you can squeeze it and have yourself a perfectly delicious glass of sweet juice, but I love to use it in savory recipes too. 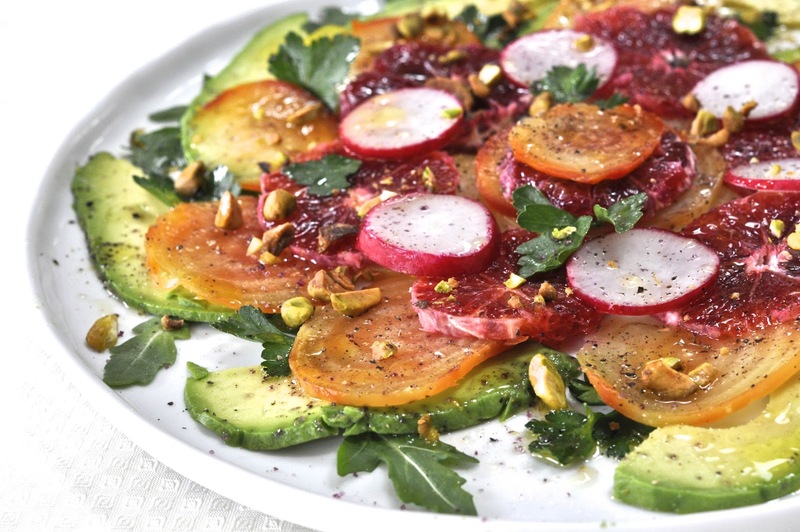 When arranged on a plate with some chioggia beets, avocado and radishes, it makes a colorful, flavorful and healthy salad – just the right thing after all that holiday indulgence. I topped it off with a few pistachios and bits of parsley and baby arugula to add even more texture and color. It’s not necessary, but if you’ve got an olive oil that’s infused with blood orange, so much the better for the dressing. I live near a store that sells many varieties of flavored olive oils but if you don’t, you can order some online here. You’ll be surprised at how much extra oomph it can impart to a salad. Scrub the beets, coat with olive oil and roast in a 375 degree oven for one hour. Cool, peel and slice into rounds. Peel the avocado and slice. Wash and slice the radishes. Peel the blood oranges and slice into discs. Arrange the vegetables and blood oranges on a plate, then tuck in some arugula leaves and parsley leaves here and there. 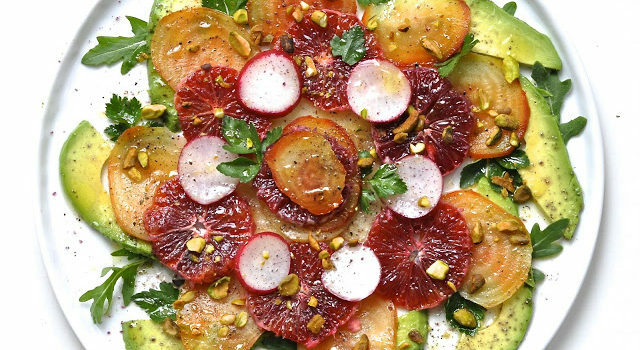 Drizzle the dressing on top, then scatter the pistachios over everything. For this recipe, which requires dozens of pomegranate seeds, there’s no worry about being beaten in Italy. There’s only the time-consuming task of removing those seeds from those pesky, pulpy membranes. The rest of the recipe is a snap. What you’ll end up with is a healthy and unusual salad that’s colorful as a Christmas wreath and delicious too. 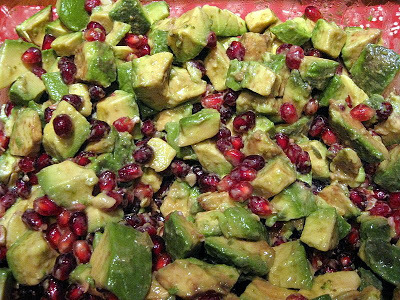 It requires only two ingredients – avocados and pomegranates, plus some olive oil and lemon juice as a dressing. It comes to you via my friend Anna Rosa, who spends a lot of time in Italy, but has never once been beaten for plucking a seed from a pomegranate. Peel two avocados and cube. Mix in a bowl with seeds from one pomegranate. Toss with olive oil and lemon juice to taste.